N-225 - Faded Cherry, Other Shape Guitar from Gibson belonging to the N-225 model. 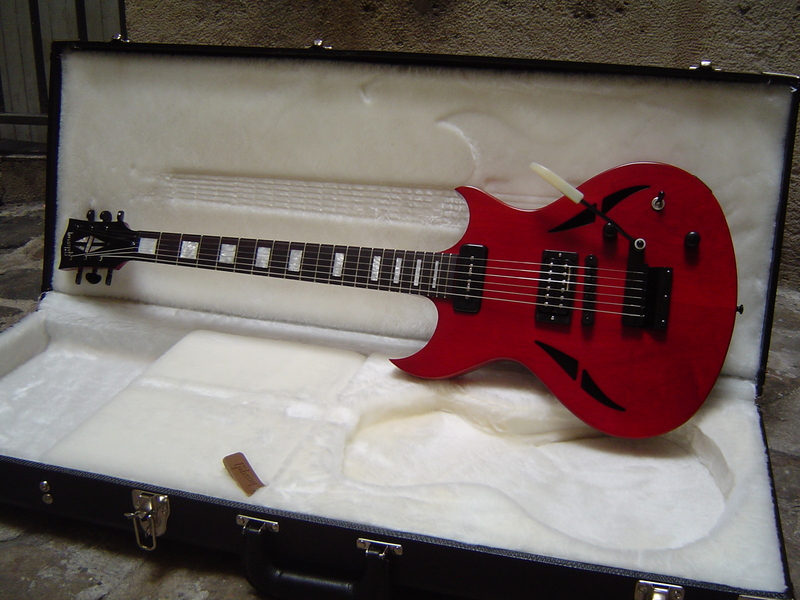 This being the case, the N-225 Faded Cherry (the model reviewed) plays the sobriety card. The nitrocellulose lacquer lets us appreciate the massive maple body with an asymmetric double cutaway; but it also has two F-holes that allow us to see inside the hollow body. 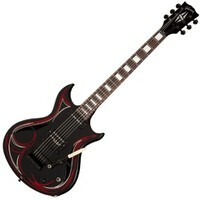 The whole hardware is black and the neck features rectangular inlays. The maple set neck has quite a slim profile, very typical in the late '60s, with 22 medium jumbo frets and a rosewood fretboard. The overall finish is very good and the very finely applied lacquer on the body lacks no elegance. Among the three finishes available, the "Ebony" stands out. It differs from the Cherry and even the Natural owing to its different aesthetic aspect. In fact, its Flames design is simply the fruit of a collaboration between Gibson and graphic artist Rick Harris, better known for his pinstriping of Hot Rods. Some will say it's tasteless, some others will be seduced... ah, tastes and colors! The strings rest on a Tune-O-Matic bridge with six independently adjustable saddles. The strings then go to a vibrato tailpiece, called "Vibrola," already used on the Angus Young and Frank Zappa SG signature models. 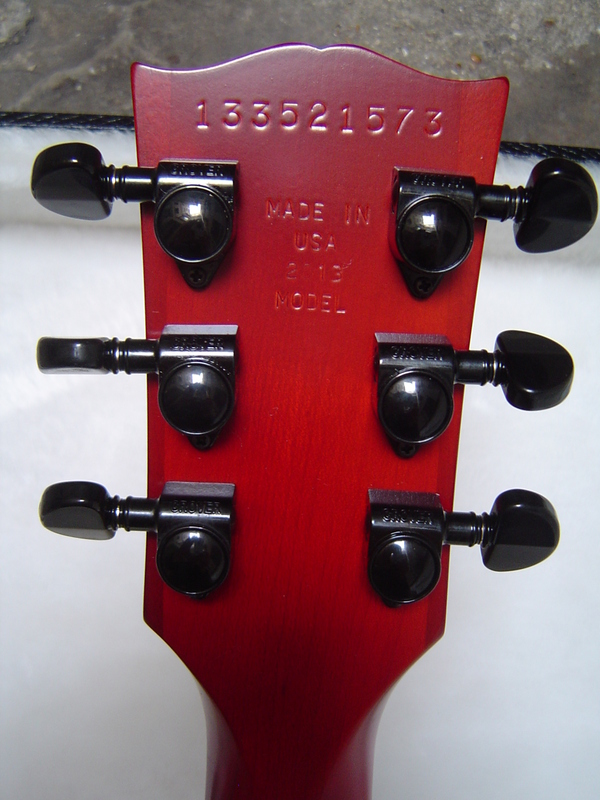 Finally, six Grover 3x3 tuners installed on the headstock are responsible for holding them perfectly in place, minimizing the risk of detuning. The N-225 is equipped with two passive pickups. 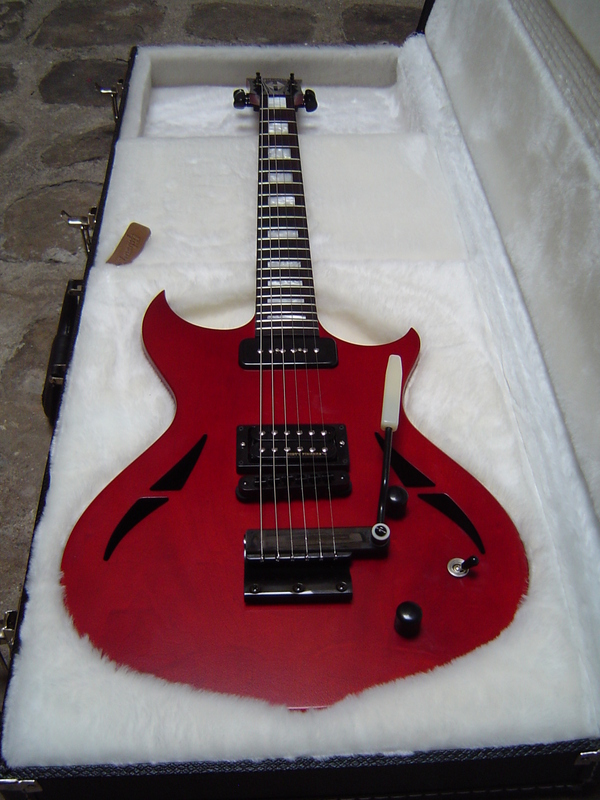 At the neck we have a P90 (single coil), while at the bridge there's an open-coil humbucker called "Dirty Fingers." Everything is controlled with a three-way switch, a volume pot and a tone pot. Do note that the latter features a push-pull system that extends the combinations of the bridge pickup by switching from a humbucker to a single-coil when pulled. The N225 is a very comfortable guitar to play. It is well balanced and not heavy. The body not being too big facilitates the positioning of the right arm (for right-handed players). The short scale (628mm) fits perfectly the neck, which is also slim and flat, guaranteeing a fluent and effortless playing. After having lowered a bit the action of the strings with respect to the factory setting, the neck becomes a real pleasure to play with. 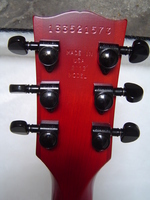 In this respect, the notched neck heel and the two cutaways were carefully designed to allow an easy access up to the 22nd fret. The only thing that mars the panel is the tremolo bar. It might prove to be somewhat of a handicap if we want to rapidly engage the volume and tone pots. The samples for the review were made with a 50 watts (Laney TT50H) tube amp head with the following settings for each channel: Bass: 5 - Medium: 5 - Treble: 6. The amp head was coupled to a cabinet with a single V30 speaker. The sound was recorded with a Shure SM57 (almost glued to the speaker, slightly off axis) + a preamp with neutral settings and a sound card. Three channels were used: clean / crunch / overdrive. And well, it doesn't sound bad at all! Played as an acoustic, the sound is rather balanced, the attack is accurate with a limited resonance nevertheless. Don't trust the F-holes on the soundboard though, they don't play such an important role in the sound projection. 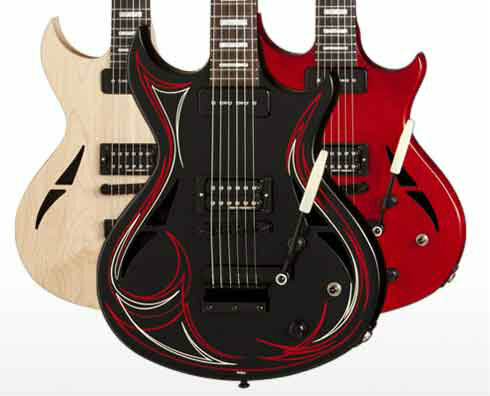 Unlike the ES-335, ½- and ¾-sized Gretsch guitars (and some others…), it's more a design concept than anything else. Once connected, you can immediately notice that the combination of the P90 and Dirty Fingers pickups give this guitar a significant versatility and diversity. In bridge position, the "DF" is rich in dynamics, while remaining well-defined once the overdrive goes up generously. Rather surprisingly, the sustain is relatively long along the whole neck, in contrast to what we observed when playing it unplugged. It is without a doubt aimed toward sharper sounds like we usually find in rock and hard rock. The P90 is more mellow, with a rounder and warmer character, typical in its genre, which adds to it being in the neck position. The combination of both pickups (both worlds I should say, because they are radically different from one another) opens up the possibilities. Nevertheless, it is difficult to get a clean and pure sound par excellence. As you can hear from the examples 1 to 5 recorded with the clean channel of the amp, it easily yields a crunchy sound with a harder pick attack. And don't forget the push/pull installed on the tone pot — a major asset of this guitar—, which allows us to find more twangy sounds, with a more extended high end and a more incisive attack. But don't be mistaken, it's far from the biting mid position sound on a Telecaster or even a Stratocaster, which is certainly not the intention anyway. 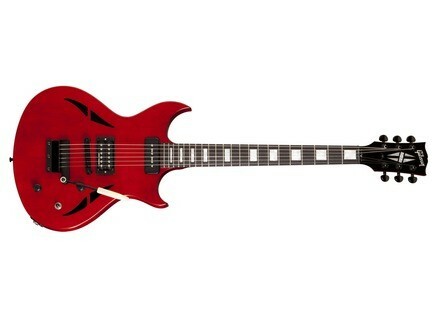 The Gibson N-225 (around $1100) has a sober look (we refer only to the Cherry model reviewed), is comfortable to play with and very versatile, thanks to the two pickups installed (P90 and splittable Dirty Fingers). Purists of the brand will most probably not be very attracted, because the decision of going for such a design might be perplexing. That said, if that purely aesthetic aspect doesn't discourage you, give it a try. 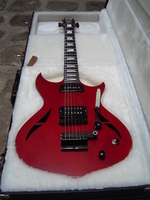 You will find in it cutting, dynamic but also warm sounds for blues, rock and hard rock, playing ease and comfort, even if the tremolo represents a small drawback, which I will eventually end up boycotting.